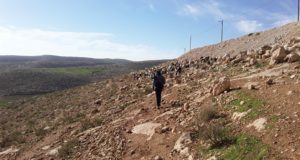 On the morning of November 6th, 2012, a house in the village of Deirit in the South Hebron Hills was demolished by the Israeli Army amidst most of the town watching and a significant amount of media coverage. 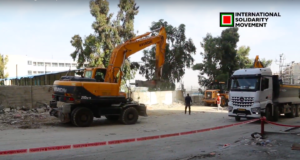 The military started moving towards the location at approximately 6 am with two excavator cranes and one bulldozer. This heavy equipment was accompanied by multiple army vehicles and border police personnel who woke up the family and forced them from their residence. The Israeli military gave no forewarning written, verbally or otherwise as to their homes destruction. The building of the house began three years ago and was on land that was perfectly acceptable and legal to build on. 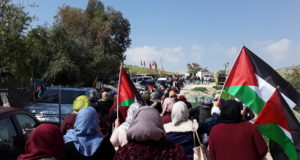 At that time the Israeli military said the digging of the foundations would be problematic but had not discussed anything further with a family that merely wanted to make a place to exist on using property they own. The building was a solid concrete structure with steal reinforcement and was obviously well built and maintained. Mohammad Moussa Abuarram was the home owner, he and his family of eight are now being sheltered at one of his brothers houses. 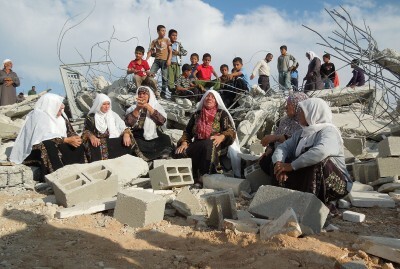 Villagers from Deirit sit on the debris after the demolition.